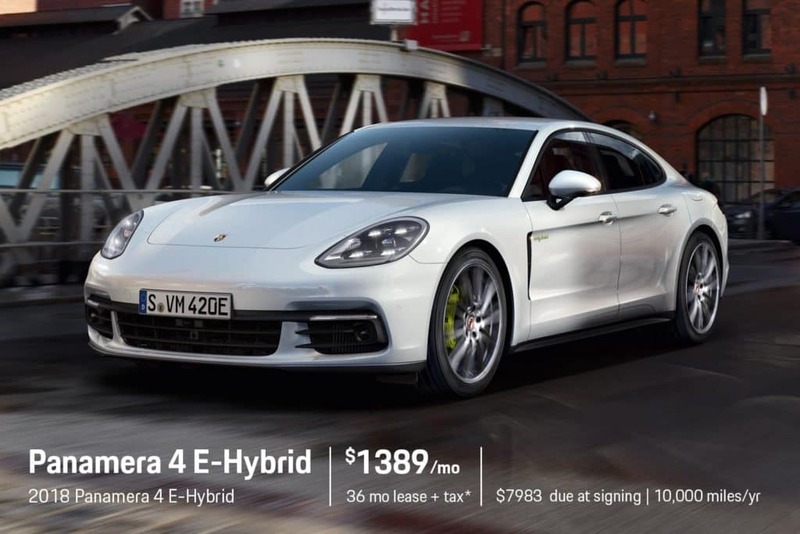 #181914 – 2018 Porsche Panamera 4 E-Hybrid in Carrara White Metallic with All-Wheel Drive, 8-speed Porsche Doppelkupplung (PDK), 2.9 liter twin-turbo V6 engine producing 330 hp and electric motor producing 136 hp, total output: 462 hp, Leather Interior in Black, Wheel Center Caps with Colored Porsche Crest, Steering Wheel Heating, 20″ Panamera Turbo Wheels, Door Handles in High Gloss Black, Smoking Package, Model Designation Painted, Standard Interior in Black, Vehicle Cable (25 ft), 7.2 kW Onboard Charger, Premium Package Plus, Voice Control, Ambient Lighting, and much more. 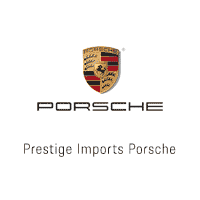 36-month closed-end lease offered to qualified customers by Porsche Financial Services. No security deposit required. May be subject to $350 lease turn-in fee. Subject to credit approval. Photo for illustration only. Advertised unit subject to prior sale. Dealer to retain all rebates and incentives. Offers valid exclusively at Prestige Imports in Lakewood, CO. Offer Expires 04/30/2019. While great effort is made to ensure the accuracy of the information on this site errors do occur so please verify information with a Prestige Imports Sales Specialist. This is easily done by calling us at 303.238.8101 or by visiting us at the dealership. 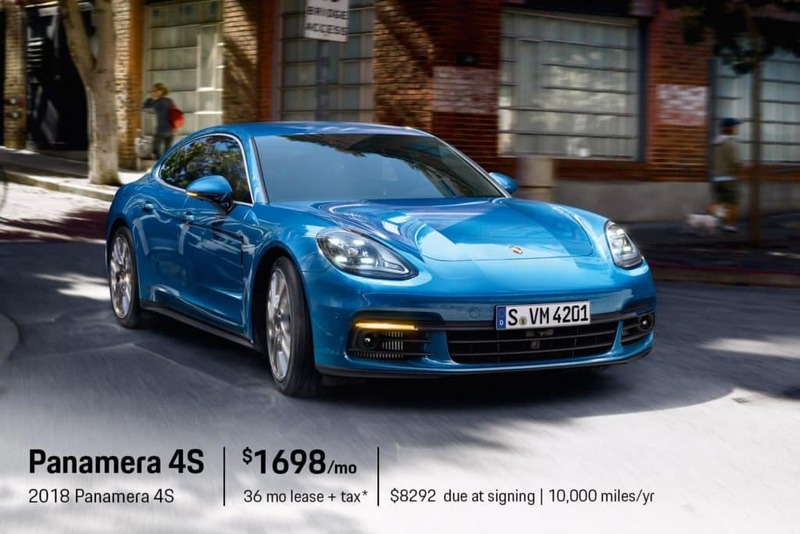 #181826 – 2018 Porsche Panamera 4S in Dolomite Silver Metallic with All-Wheel Drive, 8-speed Porsche Doppelkupplung (PDK), 2.9 liter twin-turbo V6 engine producing 440 hp, Leather Interior in Black, Steering Wheel Heating, 20″ Panamera Turbo Wheels, ParkAssist (Front and Rear) incl. Surround View, Rear wiper, Premium Package Plus, Sport Package, Assistance Package, QH1 Voice Control, and much more. 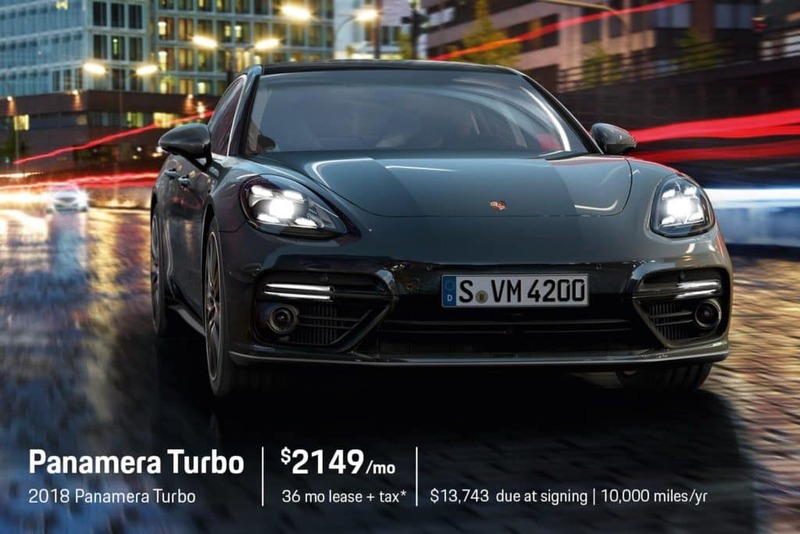 #180678 – 2018 Porsche Panamera Turbo in Jet Black Metallic with Black/Chalk Interior, 4.0L Twin Turbo V8, 8-speed Porsche Doppelkupplung (PDK) Transmission, Burmester® 3D High-End Surround Sound System, Sport Package, Storage Package, Thermally & Noise Insulated Glass, ParkAssist (Front and Rear) incl. Surround View, 4-zone Climate Control, Ambient Lighting, USB Interface (Rear), Steering Wheel Heating, Massage Seat Function (Front), Wheel Center Caps with Colored Porsche Crest, and much more.